mentally awkward and very weak. Their poor mentality diverts them to the physical sickness, but the mental strength helps the people to fight with any kinds of diseases and recover soon even if some illnesses catch them up. 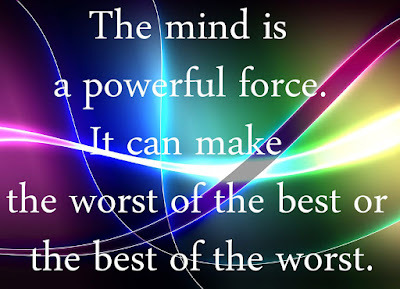 The mental strength also helps the fight with hardship, problems, and difficulties. The mental strength person can convert the adversities into opportunities, it will find the solution to the problems and new ways to exit out from the closed doors. The mentally strong person overcomes any kinds of a hard time easily and always see the new opportunities to better up the situation. Regardless of how you are strong physically and how much property you have earned in your life, you can't deserve the happiness without your mental strength.It is an essential component of life which triggers for the prosperity and success. The mentally poor people always believe they are sick, helpless, alone and under the poverty even having enough substance to live and move them on. They feel always the shortage of something unvisionary phenomenon which keeps on chasing them as a shadow.Contrary to that state, the mentally strong people believe that they are always surrounded by their loved ones even in the situation of loneliness. They don't fear about the past and future, neither they have the unconvincing doubt about their relationship and present, they always expect for the good things may come and embrace their beauty of life. They are happy for their accomplishments, though still seek to make this world better and safer place for everyone. One of the least not the last don't only run behind the money all the times rather try to find how our life is valuable and precious to us and this world. If we are mentally strong we can do better not for oneself, but for the sake of people around the world and spread the unconditional love, affection, happiness, and joys to bring the smile on everyone's face. Stay strong, train your mind for the aspiration of strength, the goal is mine, your future and smile are you!